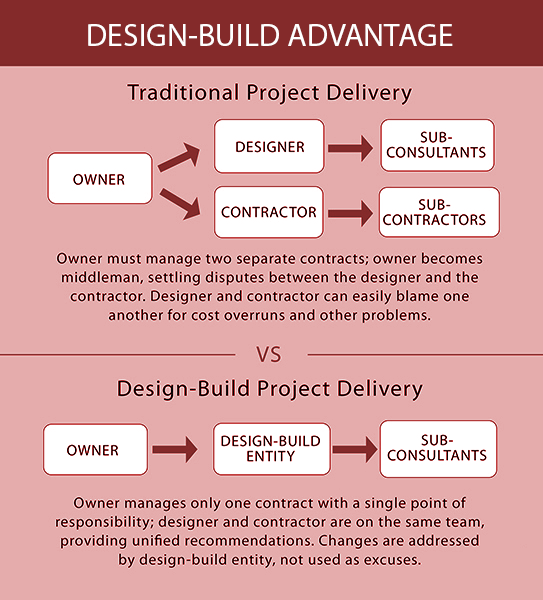 “It is important to note that the design-build method, while not focused on saving the owner construction costs, nonetheless often saves the owner money on the overall project. The combined effects of carrying a construction loan (which typically carries a higher interest rate than permanent financing) and an earlier useful on-line date usually yields considerable overall profitability to the project and may make seemingly unfeasible projects into genuine opportunities. Advantage Remodeling, Inc. will meet with you and go over your specific needs. We then put together a project estimate. At the next meeting, we review the estimate and make any changes or additions. A contract is then put together, including the start and completion dates, a payment schedule and a description of the work to be completed. This ensures everyone is on the same page. We work with several Architects and Engineers and if one is needed for your project, we will recommend the one best suited for the task. Advantage Remodeling, Inc. also works with a number of kitchen designers to help you plan your new kitchen and cabinets. You will be surprised at how much easier having and outside expert help you design these spaces.